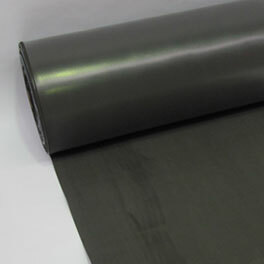 US Made Rubber Underlayment and Foam Underlay in Roll Format. 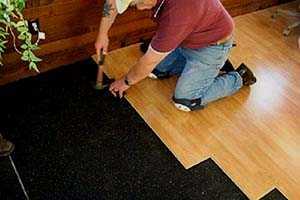 Rubber Sub Floor for Luxury Vinyl Tile (LVT), wood, or concrete flooring. Our non-perforated 2mm rubber underlay is 35¢ per sq. ft, for under wood laminate floors, vinyl sheet, luxury vinyl tiles (LVT) and stone will abate noise transmission from apartment to apartment, condominium to condominium. As well deaden noise transmission within condos, residential homes and apartment room such as musical components, voices and foot traffic. Made in the USA. 5. Our underlay can be applied over concrete slabs, plywood, gypsum concrete and under vinyl sheet, luxury vinyl tile (LVT), stone, wood laminate flooring as well as underlayment for vinyl dance flooring rolls. Call our Sale Department now for a quote: Tel. 1-661-273-8700 or 1-661-273-8701 or Text Message: 1-323-420-6794 Volume discount may apply. Rubber underlay is used for underlayment for wood flooring, linoleum tiles, luxury vinyl tile (LVT), smooth plastic decking tiles, tool liners, shelve liners, counter top surfaces, reusable protective construction flooring, and some indoor carpet tiles, etc. Applying rubber underlayment under dance flooring will provide anti fatigue properties to dancers but will slightly reduce the acoustics for tap dance. An additional 2MM, 3MM, 4MM, 3/8" or 1/2" thick or rubber underlayment will help soften walking areas, insulate against cold floors and dampen sound. Our cork yoga mats use a 2mm thick rubber underlayment. Underlayment Rolls are 48" wide and up to 200 ft. long. Minimum order for rubber underlayment is 200 sq. ft.
Cork underlayment rolls are 50 ft. long x 4 ft. wide (200 sq. ft.) cork underlay planks are 2' x 3' x 1/2" thick are available. Underlayment rolls are cut 20' or longer in linear feet only FREE of charge. 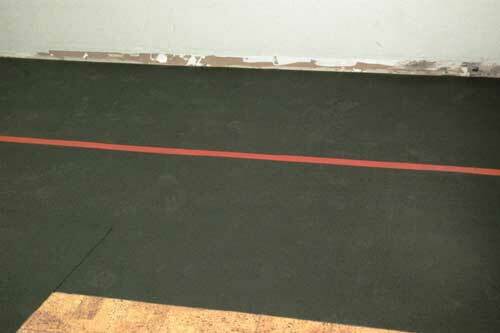 For details on Rubber Underlayment Installation Instructions. Rubber underlayment is used for wood flooring, linoleum tiles, luxury vinyl tile (LVT), plastic smooth tiles, dance flooring, tool liners, shelve liners, counter top surfaces, reusable protective construction flooring, etc. 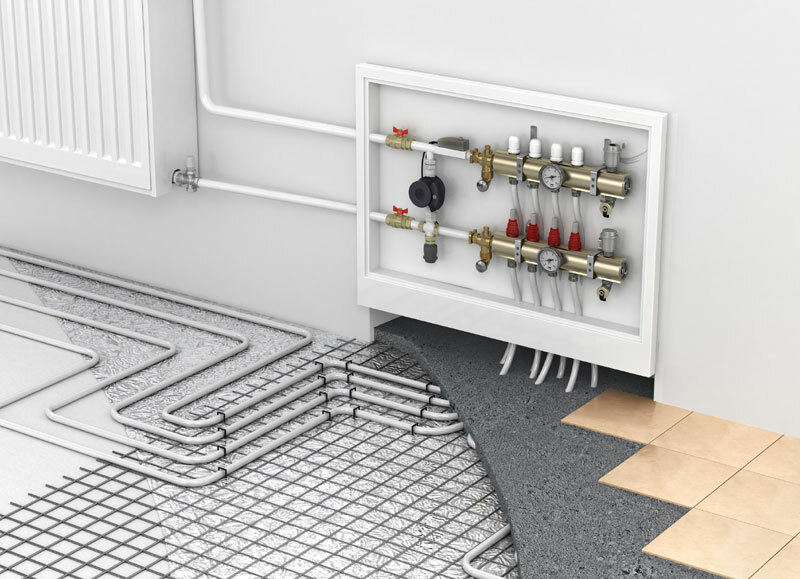 An additional 2MM, 3MM, 4MM, 1/4" , 3/8" or 1/2" thick or rubber underlayment will help soften walking areas, insulate against cold floors and dampen sound. 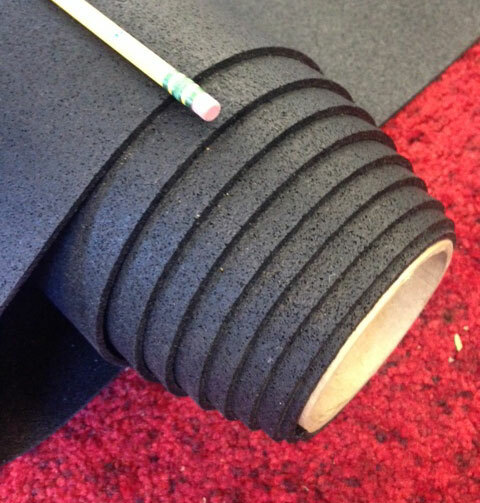 Rubber Rolls are 48" wide and up to 200 ft. long. EZ-Floor LVT is an 2mm thick acoustical underlayment for LVT plank flooring with a 69 IIC and 66 STC rating. EZ-Floor LVT is designed for most glue down vinyl plank flooring products. Made of agglomerated recycled high density foam granule with an integrated moisture barrier. EZ-Floor underlayment serves to reduce noise transmission acts as a moisture barrier and insulator. Rolls Specs: 172.33 sq. ft. per roll. Weight Per Roll: 34 lbs. $149 per Roll, 42" wide x 49 ft. x 2mm thick, 172 sq. ft per roll. Text Message: 1-323-420-6794 for volume pricing. Free Shipping! 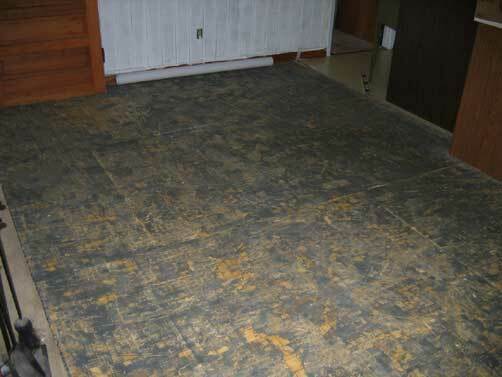 Underlayment under ceramic tiles, wood laminate wood flooring will provide superior noise abatement. This is a requirement for condominiums, Home Owners Associations and city building ordinances. Isolate and confine noise and quiet your neighbor with rubber underlayment. Above price is in US Dollars per square foot. AcoustiCork is well-suited for most floating wood and laminate flooring. AcoustiCork is ideal for cork or bamboo flooring, parquet, terrazzo or under carpeting. RC500 and RC1000 is a cork & rubber blended underlayment. Why is the duel blend superior in noise abatement? THE ANSWER: The propagation of sound transmits stronger in straight wave lengths. With the multiple densities of rubber and cork, this causes longitudinal and transverse waves to be deflected from into abstract waves. This is the essence of noise abatement. 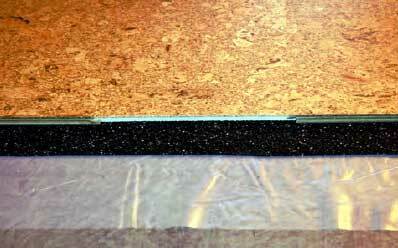 A rubber-cork underlayment is the answer to sound, noise and crack suppression. RC500 and RC1000 is a post-consumer/industrial recycled rubber product engineered for superior sound with impressive afford ability. With 'sound' and unbiased acoustical testing, RC Series is designed to meet building code compliant IIC sound abatement in actual flooring applications. Definitive in Sustain ability & LEED Qualities. Made in the USA, AcoustiCork RC300 meets the criteria of organizations that promote and support green building initiatives. With LEED requirement met this can help to qualify for points under the LEED, Green Building Rating System. Free Shipping! Other Underlayment options include R60, S130 and PR60 cork underlayment rolls and planks. 1. We purchased luxury vinyl tile (LVT) for a family room. Which product will give you the most bang for your buck? 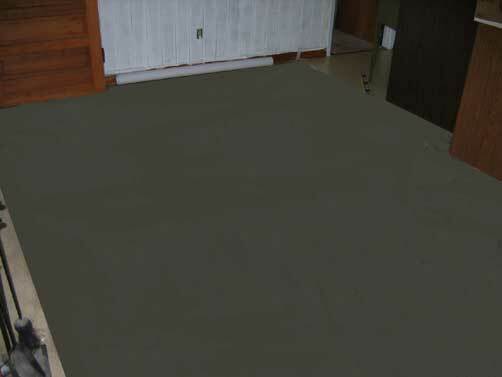 The EZ Floor LVT, which is a 2mm dense foam, recycled with a built-in moisture barrier. 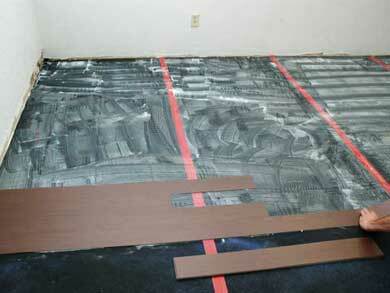 This is a glue down application, as well, peel and stick vinyl tiles will adhere will to this product. Cost: $149 for 172 sq. ft. (87cents per sq. ft.) Shipping is free, except to AK & HI. 2. Our Los Angeles, California apartment would like to purchase rubber sub floor for our 95 unit apartment complex. The wood frame building is 3 stories. Tenants complain that the floor squeaks and the noise level is high from the tenants above each unit. We must minimize the noise level. Please help. 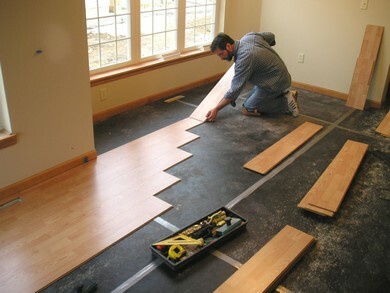 Without our flooring an expert being physically at the location it’s difficult to determine your needs. However, the wood joists may be squeaking. An underlayment will not solve the squeaking but will lessen the noise level. Perhaps a carpenter can re-nail / re-screw the wood joists, plywood, etc. Concerning the noise produced by the tenants above each unit; if a ¼” or ½” rubber underlayment will not upset the threshold then we can recommend the ½” thick rubber underlayment in roll format. Rubber underlayment will abate noise more than cork underlayment. 3. Our structural engineers have recommended a rubber-cork blend underlayment. Can you provide information, please? 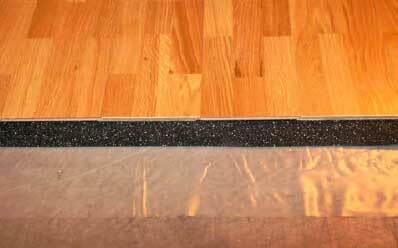 The rubber-cork blend subfloor RC500 and RC1000 is available in 5mm and 10mm thick. 4. We are a flooring contractor located in New York City. Our client is adamant in using your AcoustiCork products versus the generic cork. What’s the difference? AcoustiCork cork underlayment products are tested for noise abatement. AcoustiCork is determined & rated by analysis for each lot of cork. Each production lot of underlayment is certified with a seal of approval if and only it meets the Sound Transmission Class (STC). Generic cork is not certified or tested. 5. Do you offer free shipping for rubber underlayment rolls? No, sorry. Due to its heavy weight it must ship via truck freight. It’s too heavy to ship UPS/FedEx Ground. Only the 4x50x1/4” cork underlayment rolls ship via UPS Ground. Shipping is free. If you have a large order we suggest you fill out the estimate request form. Large orders ship by the pallet. The manager will pass the saving on shipping to the customer if we ship by the pallet. 6. My flooring contractor in Chicago told my husband that gluing the rubber underlayment is not required. Is this true or is my contractor getting lazy? It is not required to glue it down, but it is recommended. Using adhesive will add an additional moisture barrier; reduce slight movement between the bare floor & underlayment which will also abate noise. 7. We live in Houston, Texas and looking to buy rubber underlayment for our 2 story house. We purchased wood laminate flooring with a thin 2mm thick white foam underlayment sheet that is already attached, rather, already glued to the floor plank. 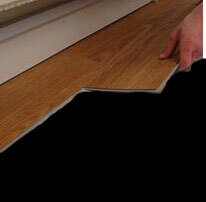 Can we use your 2mm rubber foam underlayment under the laminate flooring we purchased? Yes, an extra 2mm of underlayment under 2mm foam underlay will reduce noise further. It also may add some anti-fatigue features to the flooring. 8. Our carpet installer gave us two options for an underlayment, a 3/8” thick foam padding or a 3/8” rubber underlayment. The rubber was more expensive than the foam. Which should we use? Foam is an open cell material which can attract mold and mildew. Due to its lack of denseness it’s also susceptible to degrade/compress over a short time. Rubber underlayment is a closed-cell material, will not absorb moisture and is less susceptible to degrade over time. Rubber underlayment is better than foam padding-underlayment. The extra expensive is worth the quality. 9. Can you supply us with technical information on the recommended applications for rubber subfloor? Yes, cork and rubber subfloor instructions and performed tests are available for contractors and DIY people. 10. We are a flooring contractor in Los Angeles, CA and need 4300 sq. ft. of rubber underlayment next week. Can you deliver this quantity in 7 days? 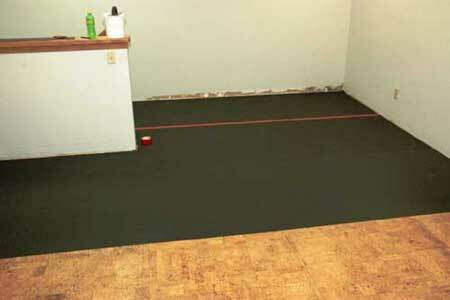 Our rubber subfloor and underlayment is available in Los Angeles, CA. We can meet your deadline.